6.3 "You need a supported DX9-compatible video card"
Download mirrors for the (Windows-only) demo is available at the official site. See also Windows Vista/Windows 7 multi-monitor crash. 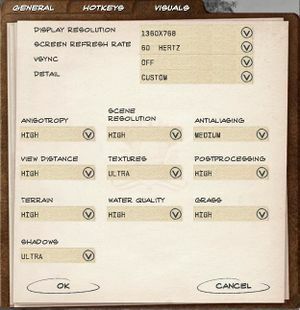 Menus and map screens are Vert-. Run the program, find config.lua in your Tropico 3 folder (if not already found) and press "Open with Notepad". Change config.IsFullscreen = 1 to config.IsFullscreen = 0. Close Decompress Config and launch the game. Change config.XInput = 0 to config.XInput = 1. There are 3 ways to fix this crash. Locate Tropico3.exe in the installation folder. 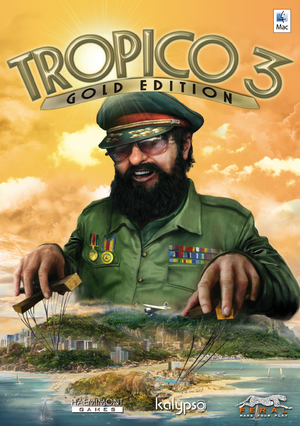 Steam - Right-click Tropico 3 in Library and choose Properties. Then choose "Browse local files". Click on the "Compatibility" Tab, under Setting check the box "Disable desktop composition". Click OK to confirm and close. Play in Windowed mode (works with Aero enabled). It is possible that your game configuration got corrupted by a system-crash. 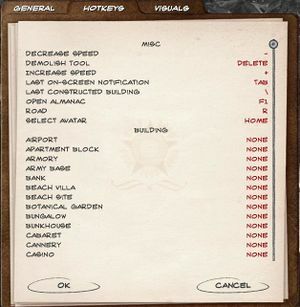 Please delete the %APPDATA%\Tropico 3 folder completely (you may copy the "Saves" folder and paste it back there after deleting). The game configuration should be reset and your game should start without problems. You'll need to enter your serial key afterwards. "You need a supported DX9-compatible video card"
If the previous fix didn't work, run Tropico 3 in Windowed mode. ↑ 2.0 2.1 File/folder structure within this directory reflects the path(s) listed for Windows and/or Steam game data (use Wine regedit to access Windows registry paths). Games with Steam Cloud support may store data in ~/.steam/steam/userdata/<user-id>/23490/ in addition to or instead of this directory. The app ID (23490) may differ in some cases. Treat backslashes as forward slashes. See the glossary page for details. This page was last edited on 15 December 2018, at 04:43.